Justice Indu Malhotra’s dissenting opinion sets up a crucial constitutional question: how do you reconcile the Constitution’s commitment to pluralism – which entails respect for group autonomy – with the claims of equality and non-discrimination, addressed from within those groups? It is this question that is at the heart of Justice Chandrachud’s concurring opinion. Chandrachud J. sets up the issue in the introductory part of his judgment, where he observes that the Indian Constitution is transformative in two distinct ways: first, in setting up the governing institutions of an independent republic, transitioning from colonial rule; but also, “placing those who were denuded of their human rights before the advent of the Constitution – whether in the veneer of caste, patriarchy or otherwise – … in control of their own destinies by the assurance of the equal protection of law” (paragraph 2). The reference to caste and patriarchy is important, because it acknowledges that discrimination is not limited to State action, or even to hostile individual action, but that it also flows from institutional design: caste and patriarchy are neither “State” nor an agglomeration of individual acts where you can attribute discriminatory agency to identifiable individuals. They are social institutions. The use of the word “public spaces” is crucial, and especially when you juxtapose it with Malhotra J.’s dissenting opinion, which we discussed in the previous post. Recall that for Malhotra J., there was a distinction between a “social evil” like Sati – where a Court could potentially intervene – and a case like Sabarimala, where the challenge was based on irrationality or immorality. It is this public/private binary – social evil (public) and bare immorality (private) – that Chandrachud J. rejects, by framing the issue as about access to public spaces. It is within this framework that Chandrachud J. begins his substantive analysis. 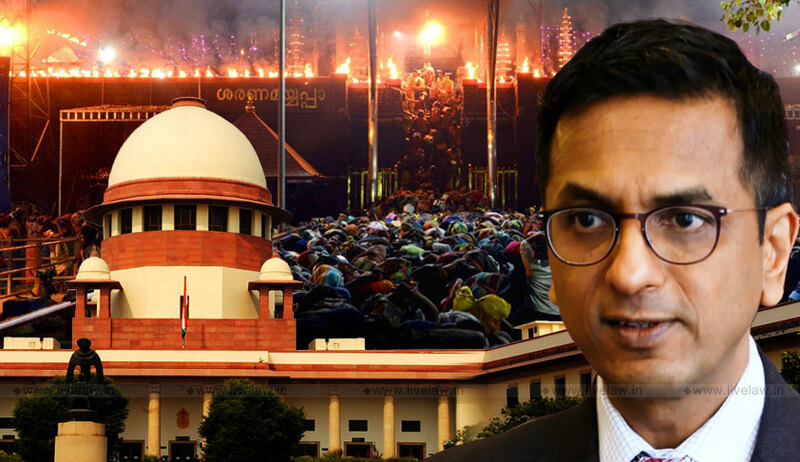 After surveying the body of precedent concerning the ERP test – and also noting the shift from “essentially religious” to “essential religious”, that we have discussed on this blog – Chandrachud J.’s judgment has a section titled “The engagement of essential religious practices with constitutional values.” At the threshold, Chandrachud J. finds that the Respondents have failed to establish that the exclusion of women from Sabarimala is either an obligatory part of religion, or has been consistently practiced over the years. The evidence, at best, demonstrates the celibate nature of Lord Ayappa, but this in itself does not establish that exclusion of women is part of ERP (paragraph 51). The phrase “patriarchal order” is an important one. It indicates that the exclusion of women from Sabarimala is not simply – as Malhotra J. would have it – a unique and particular feature of that specific religious community, and something that can be isolated from the broader world around it. Rather, the exclusion of women from Sabarimala on the grounds of celibacy and menstruation is one among countless ways in which patriarchy – as a social institution – works to keep women in a position of subordination. It perhaps needs to be noted that history is on Justice Chandrachud’s side. In India, temple-entry movements have a long history, and have always been framed in the language of civil rights, and access to public spaces. This was especially true of the great caste-based temple-entry movements of the 1920s and 30s (which are discussed later in the judgment). This substantiates the argument that in India, the “thick” character of religious life implies that you cannot simply wall it off from the rest of social life. Consequently, discrimination within religion is hardly an isolated event, like – for example – the non-appointment of a woman to a clerical post in an American Church, which was upheld by that Supreme Court. Rather, at the heart of Chandrachud J.’s judgment is the understanding that discrimination within religion both reinforces and is reinforced by, discrimination in broader social life. This understanding is reinforced in what is undoubtedly the boldest and most radical part of Chandrachud J.’s judgment. An argument was made by the intervenors that the exclusion of women from Sabarimala amounts to “untouchability” within the meaning of Article 17. The Chief Justice and Nariman J. do not address this argument, and Malhotra J. rejects it on the ground that “untouchability” under the Indian Constitution is limited to caste-based untouchability. In an important way, this links back to the previous argument about essential religious practices. It is obviously absurd to compare the exclusion of women (and mostly upper-caste women at that) from a temple with “untouchability” as we understand it. But that is something that Chandrachud J. very consciously does not do. What he does do is to link the underlying basis of the exclusion in Sabarimala with something that goes far beyond, and permeates very layer of society: this is why he specifies that the idea of impurity justifies exclusion from “key social activities.” In other words, it is not about exclusion from worship, but – yet again – how that exclusion both reinforces and is reinforced by an existing and overarching set of discriminatory institutions and systems. There is one more important thing that Chandrachud J. does in his concurrence. Noting that the exclusion of women has also been justified on the basis of “custom”, he examines – and overrules – the Narasu Appa Mali judgment on the specific point that customs are not subject to fundamental rights. In terms of outcomes, this is not new: in Madhu Kishwar v State of Bihar, the Supreme Court has already held that customs are subject to fundamental rights. However, that case did not examine Narasu: here, Chandrachud J. does, and specifically finds that its reasoning is flawed. In other words, there cannot be islands of norms and prescriptions that are granted constitutional immunity. As with the ERP and the untouchability argument, the rationale is the same: the individual is the basic unit of the Constitution, and norms, practices, prescriptions, rules, commands and whatever else that have the potential to impair individual dignity or block access to basic goods in society, must pass constitutional scrutiny (paragraph 100). In the previous post, we discussed Malhotra J.’s dissent. We saw how Malhotra J. raises an important question: how do we reconcile the Constitution’s commitment to pluralism with judicial intervention into internal religious affairs? We have now seen how Chandrachud J. has answered it: the commitment to pluralism and respect for group autonomy must be understood within a Constitutional framework that places individual freedom and dignity at its heart. The Constitution recognises group autonomy because, often, group life promotes individual freedom and dignity. Community, after all, is crucial to self-development. But groups can also restrict freedom and dignity, and it is in those circumstances that a Court must step in and balance the competing claims. It is that which makes it a transformative judgment.